Published By – Blossom Music Ltd.
Tri-prong push out centre and rough-textured labels. 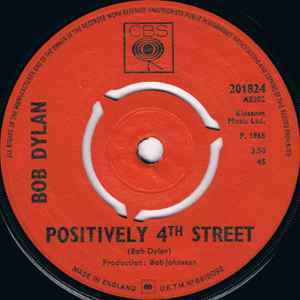 Another UK edition of Positively 4th Street pressed by CBS has a four-pronged push-out centre. An interesting footnote to these two pressings is that this Philips pressing has a wider track width when compared to the CBS pressing. This should mean this pressing either has deeper grooves or wider separation between each groove.